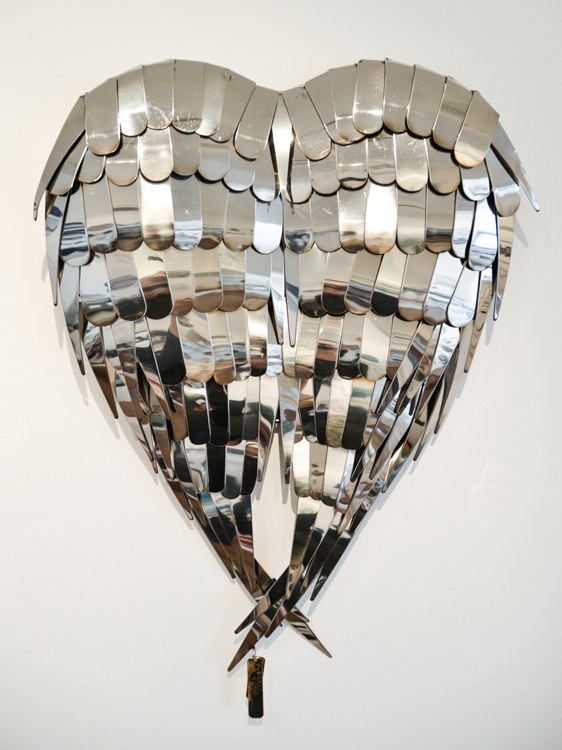 We are excited to announce Vanessa Child-Villiers to the gallery. 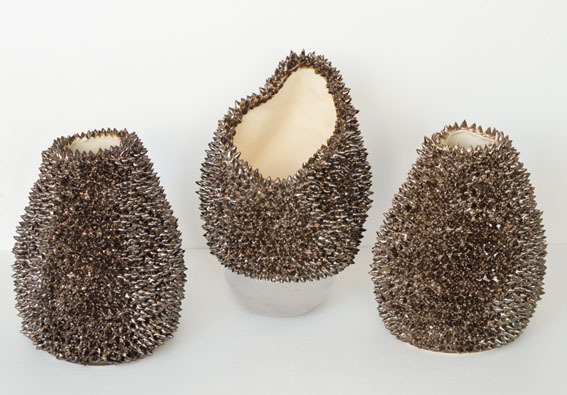 The talented ceramic artists new work “Violent Delights” can be view first hand in gallery. 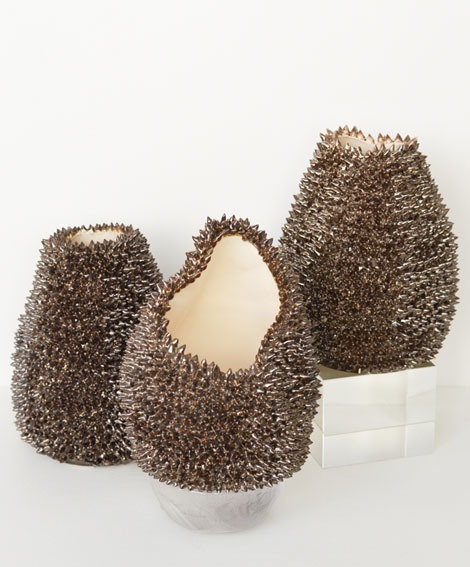 The sculptural vessels are masterfully crafted by hand with intricate details and opulence. The title speaks volumes and the work is a testament of Vanessa’s skill. 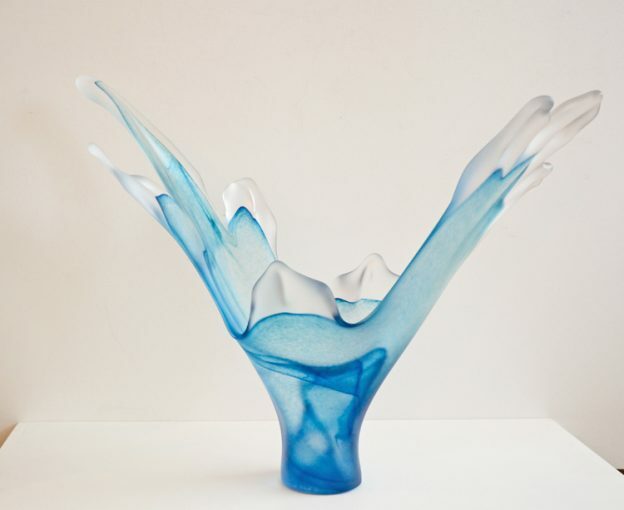 Each vessel is unique in form, one is lifted by a glass base. The interiors of each are glazed in a smooth silky cream in contrast to the bronze of the metallic oxide that covers the spiky exterior. Simply moreish and tactile work, made to dazzle and awe! The vessels are priced from £220 to £240 and approximate measurements: Height: 23cm, Width: 16cm. This entry was posted in Ceramics, New Work, Online Gallery Overview, Sculpture and tagged Art, ceramics, gift idea, Handmade, sculpture, Vanessa Child-Villiers, vase on July 20, 2018 by 45 Southside. 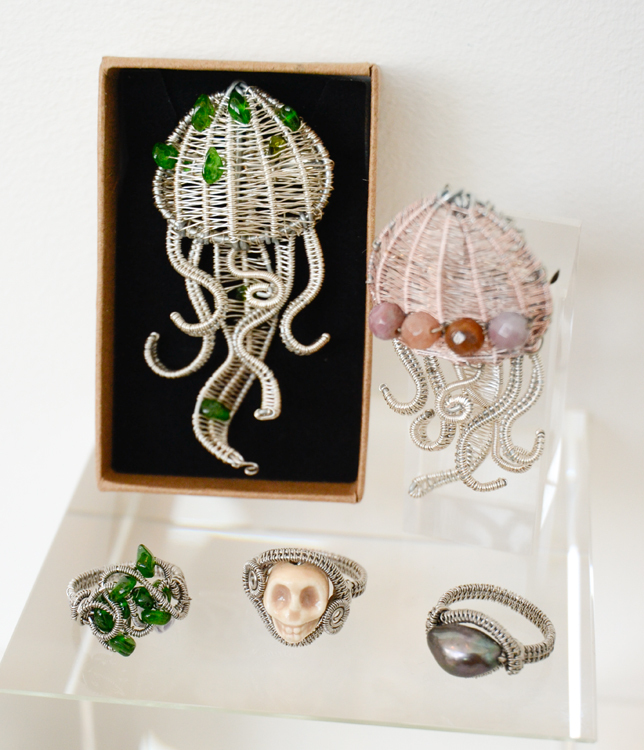 New Work By Kate Packer – Skulls & Jellyfish Ahoy! Inspired by the ocean, Kate’s fascinating new wirework reaches a depth of its own with semi-precious stones and pearls intricately weaved into the wire. 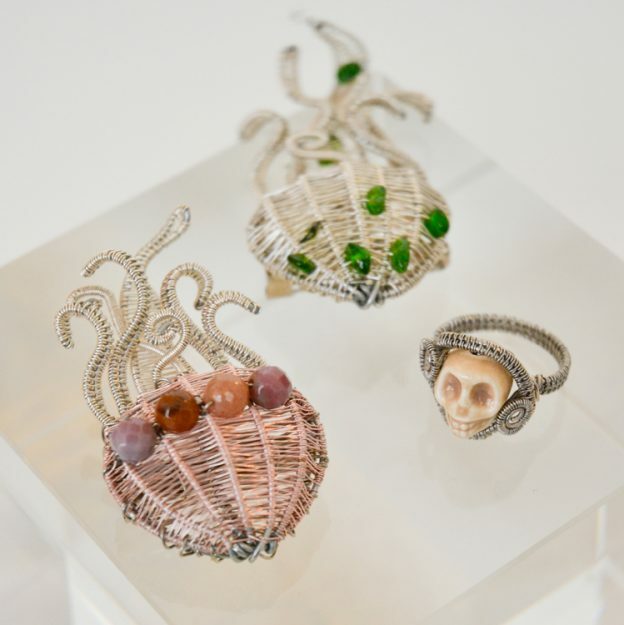 The new distinctive rings and eye catching jellyfish brooches will act as accent piece or complement any number of Kate’s earrings or necklaces. Jewellery with a stunning difference, a perfect gift for any sea lover! Gemstones as shown: freshwater pearls, chrome diopside and porcelain skull. Measurements: Brooch L 7cm, W 3.4cm. Ring size: N, L1/2 and more. Broches £42 each and Rings £20. To view more work by Kate Packer, please click on the tag in the right column. 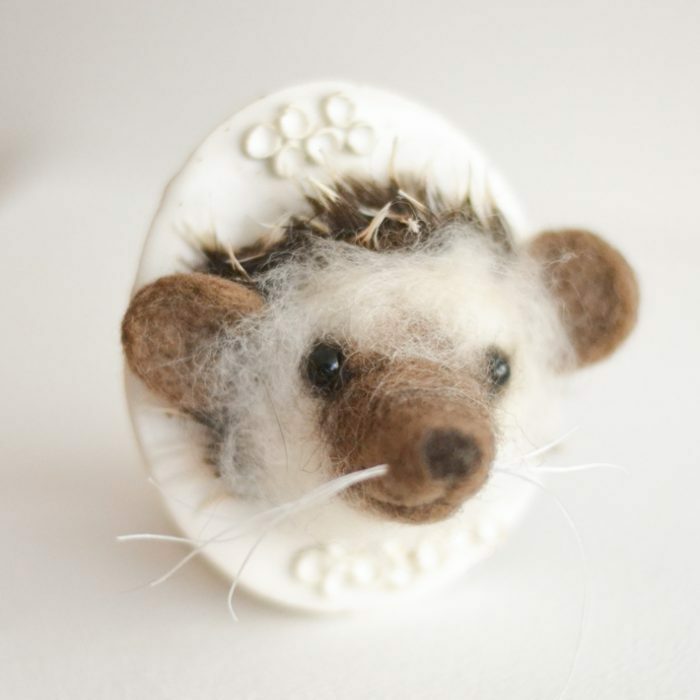 This entry was posted in Exhibitions, Jewellery, New Work, News Overview, Online Gallery Overview, Other and tagged Art, gift idea, Handmade, Kate Packer, Metalwork on June 21, 2018 by 45 Southside. The Splash is back, each one is uniquely made and a beautifully sculptured representation of water, with blue and white frosted glass spanning out and upward. Pop in to the gallery to view the Splash first hand or contact us for commissions. They can also be made with a clear, blue or green finish. So why not splash out! Approx. Measurements: H 47cm, W 59cm, D 24.5, Base 9cm. To view more work by Richard Glass , please click on the tag in the right colum. 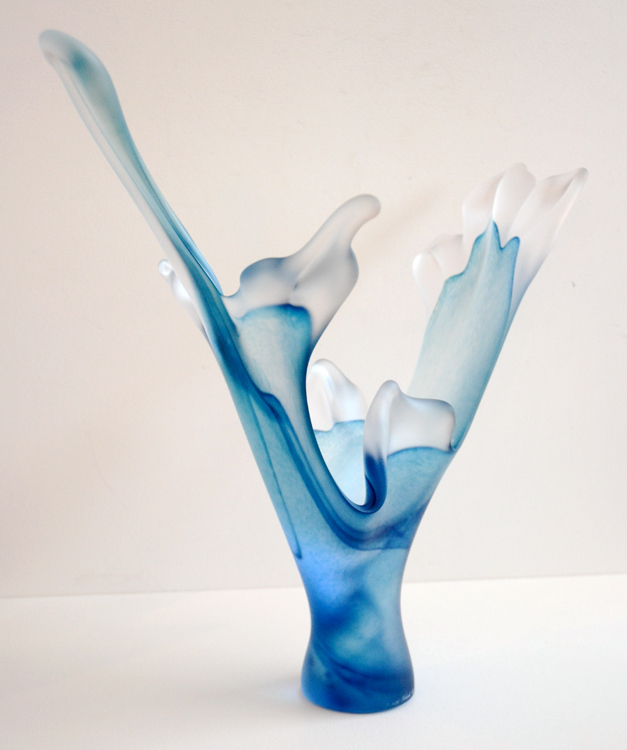 This entry was posted in Glass, New Work, Online Gallery Overview, Sculpture and tagged Art, gift idea, glass, richard glass, sculpture, Splash on June 21, 2018 by 45 Southside. 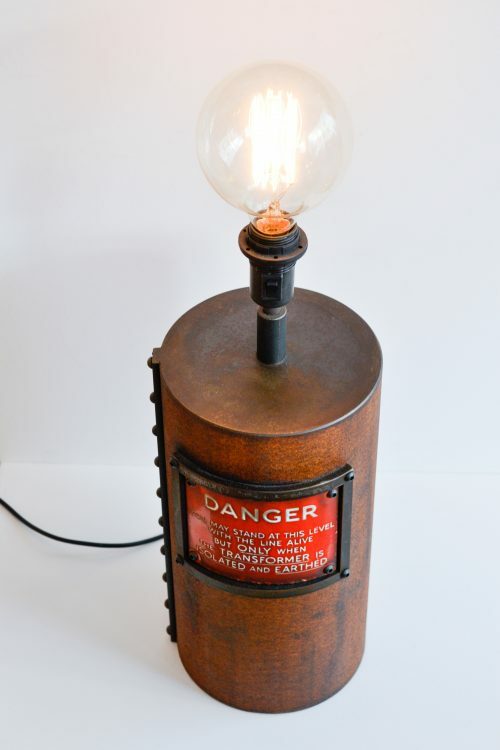 Industrially designed iron lamps with a rust finish. These heavy duty iron tube lamps with original reclaimed enamel transformer danger signs for added impact will sit well in any modern or eclectic home. There are a range of 3 sizes that can be viewed working in the gallery. 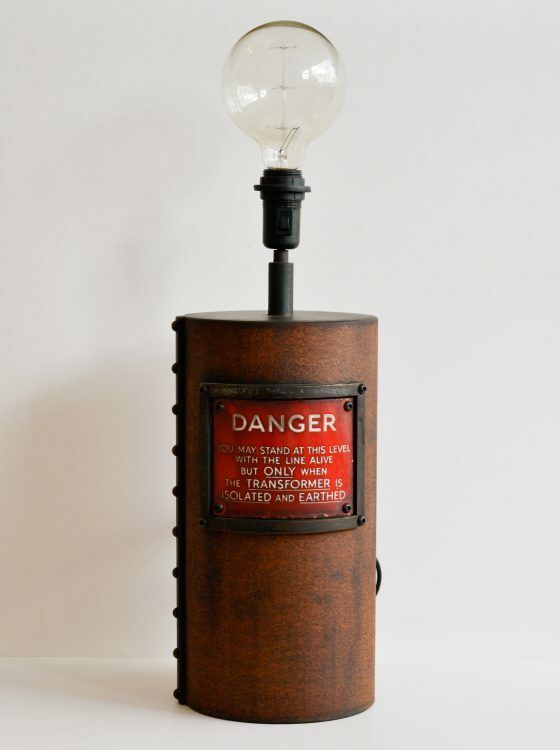 The edison light bulb is included and the lamp can be fitted with a standard lamp shade. 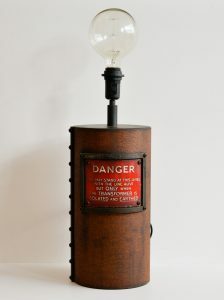 The small lamp is available through our online shop. 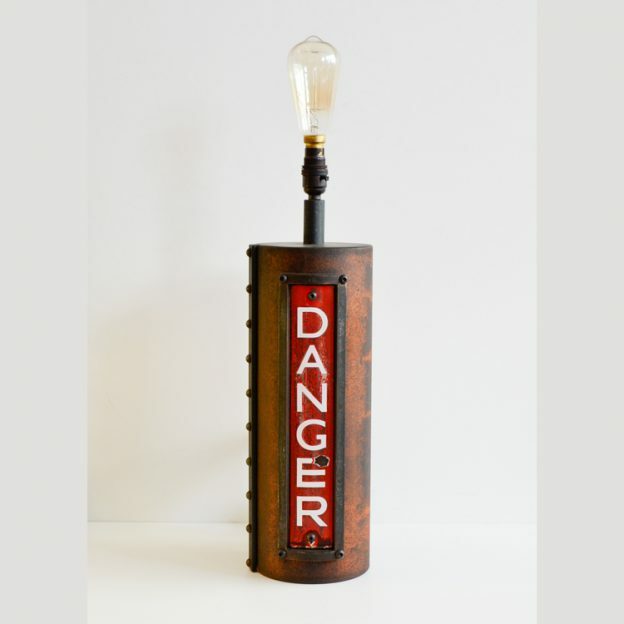 This entry was posted in Gift ideas, Lighting, New Work, Online Gallery Overview, Other and tagged Art, gift idea, Industrial Design, lamp, Lighting, Metal Work, Robert Hills, sculpture on October 4, 2017 by 45 Southside. 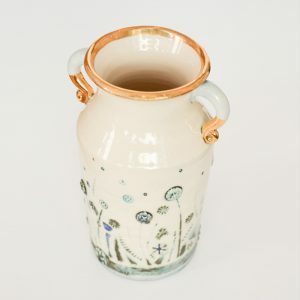 Title: Small Jug £ 49 Height: 17 cm, Base: 3 cm. Stoneware jug decorated with coloured slips, fired several times to achieve the desired surface texture. The pieces are then polished with bees wax to give them a velvet texture. 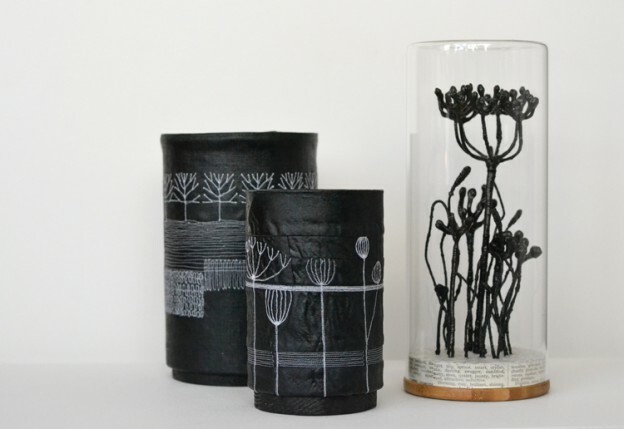 You also find Janie Ramsay’s work in our shop. This entry was posted in Ceramics, Online Gallery Overview and tagged Art, ceramics, janie ramsay on March 16, 2017 by 45 Southside. 45 Southside welcomes Tim Welbourne to the gallery. Medium Vessel £ 40. Height: 13 cm, Width: 13 cm, Base: 7 cm. 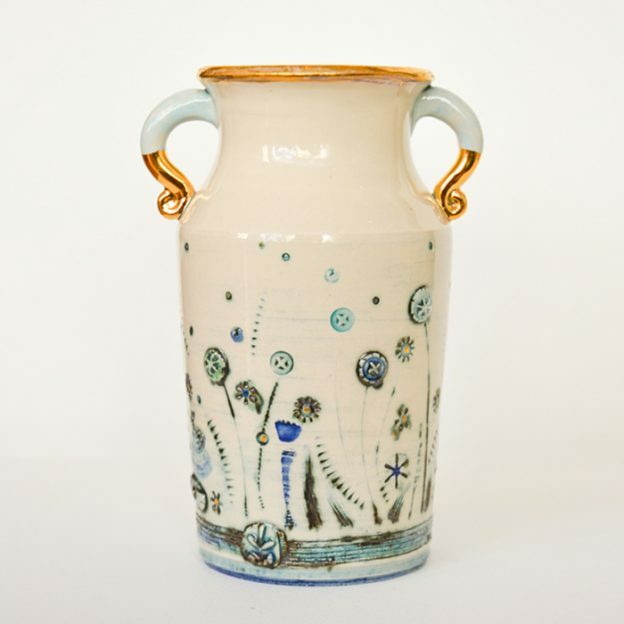 Tall Vessel £ 44. Height: 18.5 cm, Neck Width 12 cm, Base 7 cm. Small Vessel £ 34. Height: 18.5 cm, Neck Width 12 cm, Base 7 cm. .
Small Bowls £ 12, Height 6 cm, Width 11 cm. This entry was posted in Ceramics, Uncategorized and tagged Art, ceramics, Handmade, Tim Welbourne on October 20, 2016 by 45 Southside. Approx Measurements: Height 73 cm, Width 53 cm, Depth 3 cm. Commissions are welcome. Polished Stainless Steel, also available with combined Brass and Copper detail. Please contact us here at 45 Southside Gallery with any enquiry you may have. To view more wing designs by John Stewart Click Here. 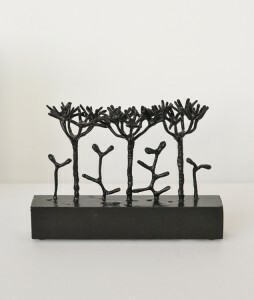 This entry was posted in Metalwork, Online Gallery Overview, Sculpture and tagged Art, Barbican, Distinctive, Handmade, John Stewart, Metalwork, sculpture on October 6, 2016 by 45 Southside. To view more work by Tracey Benton, please click on the tag in the right column. 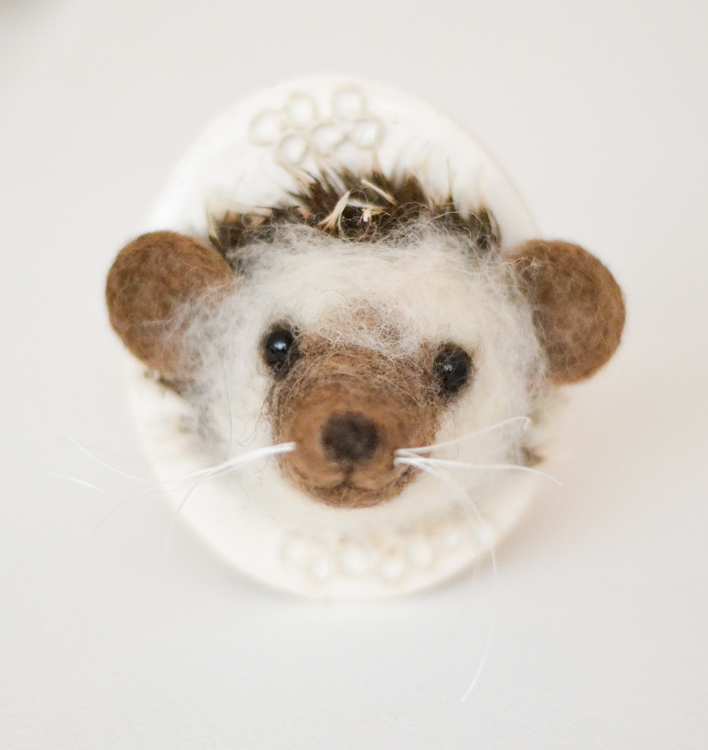 This entry was posted in Ceramics, For the Wall, Online Gallery Overview, Sculpture, textile and tagged animals, Art, Felt Hedgehog, gift idea, sculpture, textile art, tracey benton on September 29, 2016 by 45 Southside. Material: ceramic with blue and gold glazed detail. Approx Measurements: Height 17.5 cm, Base Width 8 cm. This entry was posted in Ceramics, Online Gallery Overview and tagged Art, ceramic, Sarah McCormack, vase on September 10, 2016 by 45 Southside. 45 Southside welcomes a new artist to the gallery, we are delighted to exhibit Claire’s sculptured textile works. 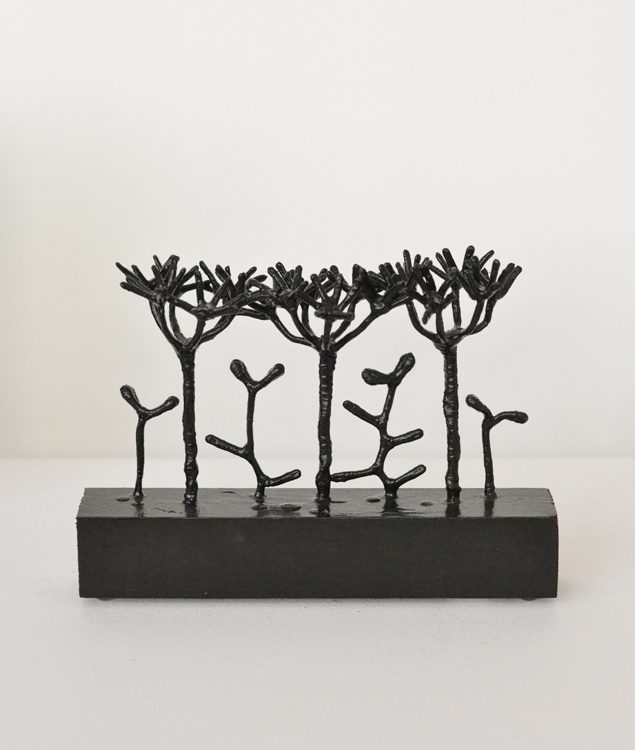 Claire has named her work ‘Textile Flora’ to reflect the materials and the sculptural forms. She re-uses waste threads and fabrics, often dyeing them black to merge the source materials into one coherent graphic form. 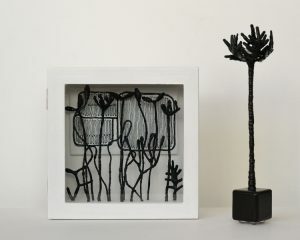 The pieces start with a wire skeleton, wrapped with thread to create the flora shapes. Each piece is coated with a protective hardener. Tall Cylinder £ 125. Height: 24 cm, Width 9 cm. Holly Topiary £ 45 Height: 23 cm, Width 6 cm. Tree Box £ 65. Size: 17.5 x 17.5 cm. This entry was posted in New Work, Sculpture and tagged Art, Claire Crompton, gift idea, sculpture, textile art on August 11, 2016 by 45 Southside.